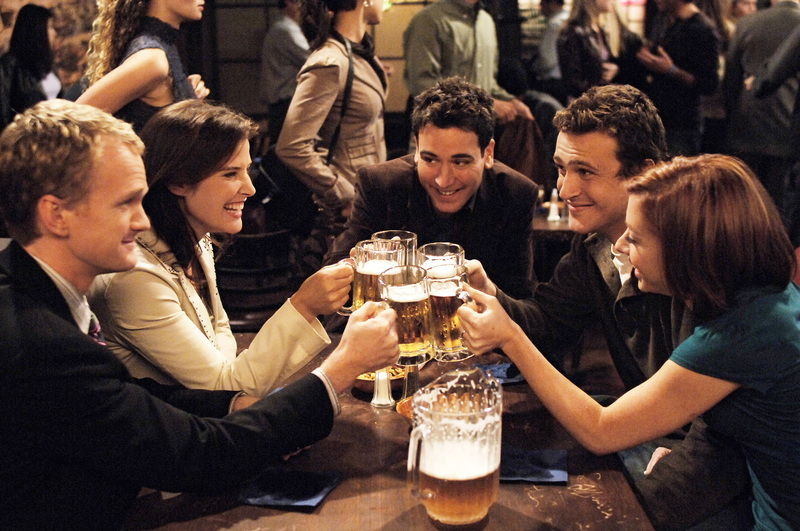 The other day I was watching the special features on a DVD of the TV show How I Met Your Mother, and each member of the cast commented on how the other cast members had begun to feel like a family. And I wondered how this made those celebrities’ real families feel. And I wonder how a celebrity feels when his real brother asks him for real money to invest in a fake business. And I wonder how to become fake friends with this real brother so I can share in this real investment money because I have plenty of ideas for fake businesses. And I wonder what happens if you’re a parent and have three children and two are celebrities, like the two Manning brothers of NFL fame, Peyton and Eli, and you have one child who isn’t a celebrity, like their brother Cooper. Does everyone make a special effort to encourage and compliment Cooper on his achievements? Does their mom reassure Cooper that passing his real estate exam or starring in a community play are just as impressive as winning the Super Bowl? And does Cooper know she’s lying? And if Mom Manning bumps into another mom at the grocery store and she asks how her kids are doing, does it sound ridiculous to say, “Peyton and Eli both won Super Bowls, and Cooper is fourth lead in The Music Man.”? And I wonder if Bill Cosby ever accidentally called his real daughters by the names of his TV children, Rudy and Vanessa, or even worse, Theo. And when people at a restaurant hear that Bill Cosby just walked in with his family, do they whisper within earshot of his kids, “Oh, that’s a shame. It’s just his real family.”? And I wonder if George Clooney ever asked Brad Pitt for an autograph when Brad Pitt was famous and George Clooney wasn’t. And I wonder if George got really nervous before he approached Brad and when he said to his date, “That’s Brad Pitt,” his voice cracked with excitement and he felt ashamed. And I wonder if any celebrities are thinking about me right now. ← Dear Parents of Our Son’s Best Friend: Did You Hear Your Son Called Us the Coolest Parents? What a great Monday morning read. If you liked it on Monday you might try it again on Tuesday. NO…they are too self absorbed in their own fame.. But they must spend some time thinking of other celebrities or about people who should be celebrities, right? As the indisputable favorite of three kids, I can tell you that the other less popular ones numb themselves to the sting eventually. That’s encouraging. That gives my less famous kid something to look forward to. Too funny. We wonder the same things in this house!! Yes, yes I am thinking about you right now. This post hits too close to home…it stings me a little, it hurts. Maybe it’s because I’m one of six kids and my mom still calls me Theo? And hey, did you know I was the understudy for the third orphan in Oliver!? But wasn’t that third orphan named Theo? Is it possible your mom was trying to help you get in character? Whoa. You just saved me years of therapy! You’re so vain. You probably think this comment is about you. But it kind of seems like it is, right? I thought it was. Maybe it was the apricot scarf and the groovy gavotte. Every year when I’m gnawing on a turkey leg at Thanksgiving dinner I think of celebrities and wonder if they are also gnawing a turkey leg and wondering about me gnawing a turkey leg. Surely they are. At the very least you’ll know that I’ll be thinking of you gnawing that turkey leg come Thanksgiving day. Can I reblog this tomorrow? You’re welcome to reblog it tomorrow and/or every day after that. Heh. I thought you’d probably have some idea like that . . . I regret to inform you you won’t get much of a following from my blog . . . since mine seems to have been misplaced somewhere. But I wanted to share in the Great(sby)ness. My guess is that most celebrities are thinking of you now and wondering why Brad Pitt and George Clooney? Why were they not mentioned? It could have been Winona Ryder and Angelina Jolie. I know Angelina was really excited to learn some mad acting skills from Winona. Not to mention the shop lifting skills in case the acting thing didn’t work out. I’m pretty sure all of Hollywood has now adopted you as their family so you will mention them in your posts. I feel terrible for leaving all the other celebrities out. I’ll have to write another post listing all the celebrities I think about in a given week. So Funny! I bet Cosby did mix up names from time to time. It would be have been understandable back then, but now when he calls his wife Clare, I bet he gets more than an eyeroll…. Ha! But that’s got to happen now and again when actors spend more time with their TV spouses than their real ones. Has it happened to you??? I’ve been in a number of plays where I’ve spent more time with my onstage love interest than with my wife, but luckily I haven’t called anyone by the wrong name yet. If a member of my family was part of a celebrity family in the way you describe, then I would naturally assume that, by default, I too was part of that celebrity family, an indisputable blood tie. And also because my name is Vanessa, like Bill Cosby’s TV daughter, so I know all about being part of a celebrity family. That’s a very positive, glass-half-full way of looking at it. Sometimes my co-workers feel like a real family — a dysfunctional, self-absorbed, highly competitive, backstabbing family. Maybe that’s what the cast of How I Met Your Mother meant. How often do you suppose other diners send over complimentary Jello pudding pops to Bill Cosby? That must drive him nuts. Do you think so? Because every year when we attend Bill’s birthday party we bring him Jello pudding pops and he seems genuinely excited each time. I’m not a celebrity, but I’m thinking about you right now. What are you wearing? Don’t be all freaked out; I’m not a stalker, I just know stuff. By the way, you’re out of milk. We honestly are out of milk, although that’s usually the case 3 or 4 days a week. This post brings me to hearty belly laughing. Your mental processing of what strikes you about life and people and our shenanigans is at a speed I can almost match! Family dynamics be they organic or fabricated make for hours of conversation in the work I do daily. Perhaps those celebrity children with seemingly great lives and lifestyles are hungry for the simple wonder year days of their lives? And who is thinking about me right now? Huh! I appreciate your blog and pov very much! I’m sure lots of people are thinking about you right now, but this begs the question of which is more important: the quantity or the quality of the people thinking about you? I’m thinking about you right now, so yes. I am a legend in my own mind. I’m thinking about you, too. What happens when two celebrities are thinking about each other at the exact same time? I wonder if Brad Pitt ever searches for pictures of George Clooney on Google Images. I want to be adopted by a celebrity family. Do you think I’m too old for that? You’re certainly never too old to dream about it. Cooper Manning was good at High School football, right? I don’t know…seems like something I saw on Monday Night football once. What I do remember is that one of the other Manning brothers won the game. Cooper played in college but had a health problem that prevented him from continuing. Having just come from So Cal, it’s business, all business. Yet, ya gotta love it. Are you saying they never take any time out from business to think about us normal people? Or at least to think about people like me who are somewhere in between normal and celebrity? Thank you Paul for giving me a WONDERful Monday as your blog always puts a smile on my face. Delirious with laughter, a common problem after reading your blog, I found myself wandering into DVD aisles in search of the “The Wonder Years” DVD for its special features section, if they had one. Frustrated by this turn of events, I stumbled onto the “Wonder Woman” DVD set with Lynda Carter and Lyle Waggoner! But now I find myself wondering what Lyle is doing these days, I’m in trouble aren’t I? I think I have the Good Greatsby virus where you walk around with a smile on your face. I’ve been searching for The Wonder Years on DVD for years and years, but it’s never been released because the show used so much classic period music in each episode and it would cost a fortune to license them all for DVD. 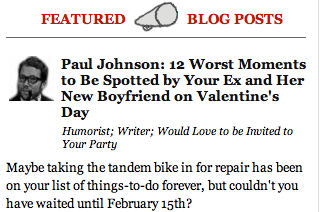 I sometimes wonder if Paul Johnson thinks about me when he’s writing his blog posts. I wonder if he ever thinks about sharing ideas with those less fortunate writers who are stuck without witty ideas of their own. Does he prefer his sandwiches cut straight down the middle, or on the diagonal? Maybe he doesn’t cut his sandwiches at all, and risks getting peanut butter and jelly on his cheeks. I can’t say I necessarily think about you while writing my blog, but I definitely think about you when reading your comments on my blog. Is that just as good? As long as you see my comments for what they really are: desperate cries for attention. I suppose it makes sense. You spend a lot of time around some people and sooner or later, you can’t remember that you have real brothers and sisters. Your old memories of childhood get all mixed up with the new family. Of course, eventually, the sibling rivalry begins and the fighting and then you end up hating each other and not talking for years. Celebrity siblings are left out of parties, get togethers and wills. Be afraid of what you wish for, celebrity families. None of this comment reflects my current living situation, btw. I’ve had the same experience just from watching television. It’s hard to deny those sitcom characters are having a much better time together than my real family and I ever did, and it’s tempting to start blending TV memories with my real ones. This guy always makes me LOL. No, really. Now I’m wondering too ….lol! I wonder if my real children get upset when I call them by the names of the celebrity children we never had. Maybe your children should use your faulty memory as motivation to stop being disappointments and become real celebrities themselves. So many wonders, so little time. God you’re funny; I laugh every time I read your posts. And I’m thinking of you right now; though I’m not a celebrity (yet). Wait, no … sorry, I was thinking of a number between 1 and 10. I just didn’t feel like people were thinking about me enough. By taking longer breaks in between posts, it gives readers more of a chance to miss me. Classic psychological move – it’s obviously working! Bring back the GG! I’m thinking about you right now. And watching. Always watching. You didn’t say that you wonder whether when I see a celebrity in real life I call them in my head with their characters’ names but I just want you to know that I do. I think George Clooney spent his unfamous years telling everybody that he was going to become famous. Seriously, I think he gave his math homework to his 8th grade teacher and told her to hold onto it because his signature was going to be worth something someday. What a charmer! I wonder if having a real spouse and also a TV spouse is legally polygamy and if having a celebrity spouse is what causes so many Hollywood divorces. If only celebrities would watch their real families on a fake TV more, they might be able to avoid a real break-up that might one day be serialized in a docudrama or After School Special. I thought this would be better. I don’t understand the admiration towards celebrity status. Celebrity for good work is what turns me on. I wonder sometimes if I could become famous by getting someone to pay me to be famous. Like all these reality t.v. celebrities. Really someone is just paying them to be a famous version of themselves. If anyone is up for an experiment I would be glad to accept a million dollars to be famous.